ROCKHILL AND RICHLAND. WHEN THE ST.
A great man once said, "What's in a name; wouldn't a rose by any other name smell as sweet?" I am just wondering if this little West Collin County town would mean the same with a name other than Prosper. To me, this name is a very appropriate one for this little town situated in the heart of a prosperous farming section. In the beginning its three room frame school building, with two teachers was called Richland. Due to the fact that Texas already had a town by that name, Mr. T. C. Slaughter, a citizen, suggested the name of Prosper. In 1901, the first railroad was started and the town of Prosper had its beginning. It was not until March 17, 1902, that the first passenger train came through causing very much excitement. Rock Hill, its churches, residences and business houses moved to Prosper and located on the east side of the railroad track. J. J. Maxey was the owner of the first grocery store and jim and Joe Taylor, the first gin. In 1902, Prosper had its first postmaster-L. A. Anderson, who also operated a grocery store in the same building. A short time later the store and post office were taken over by B. J. Naugle, who served as post master until four or five years ago when this was taken over by A. E. Robinson. A rural route was established July 1,1904, with our present banker, Mr. U. N. Clary, as carrier. In 1929 the route was consolidated with Celina, Frisco and McKinney. In July, 1903, the Continental Bank and Trust Company was established with C. A. Sanford as cashier. In 1929, the name was changed to the Prosper State Bank. The territory served by this bank has been extended until now it serves a large part of West Collin County. A four-story flour mill was built in 1904 to accommodate an enormous wheat crop. Our town has grown until we now have five grocery stores, three grocer, one cafe, three churches, two gins, mill and grain elevator and a lumber yard. Prosper, Collin County, Texas. "Where lies the future of your town?" somebody once asked Banker U. N. Clary of Prosper. Clary, a soft-spoken courteous man who has lived all his life in the vicinity of this 244-population community wasn't at loss for words when he replied. "The future of our community," he said, "will be just about like the past." "This community furnishes 3,000 to 4,000 bales of cotton each year for the world, 75,000 bushels of wheat, thousands of dollars worth of dairy products and, above all, it furnishes boys and girls who go to the cities and other places and contribute to their development. "As long as we continue to do this, we fill our place in the scheme of things." Monday night the little town of Prosper observed its fiftieth anniversary. There was a program at the Methodist Church, sponsored by the ladies of the town's three churches. Citizens had an opportunity to look back on the events of the past half-century. Although Prosper's population has remained virtually constant during that period, it has always tried to carry out its role in the scheme of things. The town, at its present site, dates from 1903, when the St. Louis & San Francisco built its line through Western Collin County. ___ that the town had been located about a mile north of the present location. In the 1880's a common school district was started there and the place was called Richland. When Richland was designated for a post office, it was found that it would have to change its name. There already existed another Richland, Texas, in Navarro County. Postmaster L. A. Adamson asked for suggestions one day, and a by-stander, J. C. Slaughter, suggested Prosper. He didn't have any particular reason for selecting the name, but it stuck. With the coming of the railroad, Prosper moved, lock, stock, and barrel, to the present site. The little town of Rock Hill, which was two miles south of present-day Prosper, threw in its lot with Prosper. All that's left as a reminder of Rock Hill today is a filling station, which bears the name of the old site. What happened at Prosper, also happened all along the new Frisco line -- at Celina, Frisco and other places. New towns sprung up along the right of way. Churches, Schools, businesses and homes moved to the new towns. Citizens of Prosper early showed their independence. A group of outsiders, who had inside information on the route the Frisco line would take, bought up farms near location of stations-o-be and formed townsite companies. Some of the land at Prosper was bought from Dr. A. U. Bryant of McKinney, but Dr. Bryant kept a tract of land just east of the townsite. The tract was on high ground that gave a commanding view of the surrounding countryside. Citizens shunned the lots of the townsite company and bought lots on the high ground. Eventually, the townsite company, highly incenses, took action. It built a four-strand barbed-wire fence between the highlanders and the business district of the town. The first night after the fence went up it was cut to bits. The townsite firm built another fence. It met the same fate. "The company finally just threw up its hands in surrender," recalls Banker Clary, "and it never put up another fence. And it didn't sell its lots either." Most of Prosper's residences today are on the high ground, although some are on Highway 289 the approximate route of the old Preston Road that ran north from Dallas to the Preston Bend of Red River. The actual route of that old wagon road is about a mile east of Prosper -- an almost impassable dirt road today. Although it is no bustling town with industrial development on its fringes, Prosper is proud of the things that it has--and has had for most of its years. There is a 12-grade accredited high school, tow well-equipped gins, five grocery stores, a thriving egg industry, a branch grain elevator, a city-owned water system, a bank and a 20-man volunteer fire department. There are three churches, Methodist, Presbyterian and Baptist. The town's economy is solidly based on agriculture. Banker Clary is proud of the people that have gone forth from Prosper to make their mark in the world. "There are probably more former Prosper people living in Dallas than there are residents in Prosper," he says. "I regret that they have to leave Prosper to find their opportunities, but I don't think they'll every be sorry about having come from Prosper. "I don't care whether this town ever grows or not as long as we can contribute to the feeding and clothing of the world and our boys and girls go out and do their part in life." That, as Clary points out, seems to be the function of Prosper. A visitor gets the impression that as long as Prosper and other towns like it continue to exist everything is going to be all right. ...In order to lay the basis for Prosper's birth, we have to go clear back to 1859, when the state of Texas appropriated ands for the education system of the state. County courts in 1876 ordered small tracts of land be established so that it could readily be sold. Most of the land sold for $3.50 per acre, with the tracts being approximately 160 acres. Dr. A. T. Bryant of McKinney purchased one of these tracts of land and it was that tract of land that formed the nucleus of our community, Prosper. A group of outsiders, who had inside information on the route the Frisco line would take, bought up farms near locations of stations-to-be and formed townsite companies. However, Dr. Bryant kept a tract of land just east of the townsite. That tract was on high ground and gave a commanding view of the surrounding countryside. Citizens shunned the lots of the townsite company and bought lots on the high ground. Eventually, the townsite company became made and took action. They built a four-strand barbed wire fence between the highlanders and the business district of the town, as it was forming at that time. The first night after the fence went up it was cut to bits. The townsite company build another fence. It met the same fate. The company gave up and adhered to the desires of the people to settle on high ground and keep the flats for farmland and for business houses. Most of Prosper's residences today are on the high ground, although some are on old highway 289. The approximate route of the old Preston Road that ran north from Dallas to the Preston Bend of Red River is about one mile east of Prosper. In the 1880's a common school district was started about a mile north of the present location and was called Richland. When Richland was designated for a post office, it was found that it would have to change its name because another Richland, Texas, existed in Navarro County. Postmaster L. A. Adamson asked for suggestions from a group of citizens. J. C. Slaughter came up with the name of Prosper, because as he noted, it appeared there was to be a prosperous crop that year. With the coming of the railroad, Prosper was moved, lock, stock and barrel to its present site, which dates back to 19902. The little town of Rockhill, which was two miles south of present day Prosper, threw in its lot with Prosper. All that remains of Rockhill, today, is a building that formerly contained a filling station, grocery store and living quarters. That building is to be dismantled in the near future. Drude Talkington and wife, Mary Jane, have built a new home on the tract of land where the Rockhill store premises stood for many, many years. What happened at Prosper also happened all along the St. Louis and San Francisco Railroad line. New Towns sprung up along the right of way. Churches, schools, businesses and homes moved to the new towns. The Post Office which had been established at Crickett Corners moved to the present business district in Prosper in 1902. B. J. Naugle became postmaster after the post office was established in the present Prosper. In the fall of 1902, a frame two story school was built on the site of the old school campus. The student body was moved from the Richland site to the Prosper district's new site during the 1902-03 term of school. J. B. Henderson was principal. The Masons from Rhea Mills community built a two story, frame lodge hall under the name of Lee Lodge in 1902. A portion of that building still stands after a fire destroyed the upper floor of the building about four years ago. Prosper's first store, on the present townsite, was built on 1902 by J. J. Maxey, the same year the Frisco Railroad was completed through western Collin County. The first mill under the name of farmer's cooperative mill was operated near the railroad tracks until it burned in 1912. Beanland and Martin built a new mill in the same general area and operated as a flour, corn meal and feed mill until 1939. C. E. Beanland was manager of the mill until Kimbell Milling Company purchased it in 1939, at which time it ceased to operate as a mill and became a grain elevator with Roy Skelton as operator. Fred Field was employed with the business for about forty years, until his retirement a few years ago. The business now operates under the name of Chickasha Cotton Oil Company and operates in agriculture products. Charles Webb has been with the business for many years now and is presently still with the firm. First edition of the Prosper paper as it was printed and distributed on Friday, October 7, 1904. The paper was in operation for about two years. From the beginning of the operation of the first school in 1902, where Mrs. C. E. Beanland, the former Anna Keen, and Mrs. Glen Sneed, the former, Leta Higginbotham and J. B. Henderson were teachers and the school had one hundred students enrolled. .... The original building was sold in 1910 and was moved to Ma Webb's corner, where it became a hotel. A two story red brick building was constructed on the campus and two more teachers were added. That building was destroyed by fire in 1923. Another two story brick building with nine classrooms and a large auditorium was built to replace the burned out building. Later years saw the consolidation or detachment of several other schools into the Prosper district. Among these were White Elephant, Good Hope, Richland, Walnut Grove, Rheas Mill, Pleasant Valley, Possum Trot and Rock Hill. 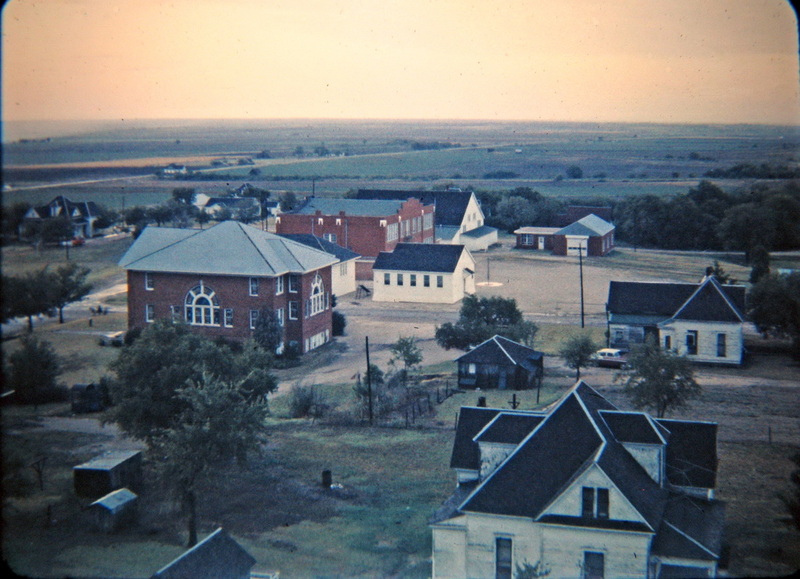 After 40 years, a new school building was built on a ten acre tract of land, two blocks northeast of the old school campus.